This week, we talk about secrets to getting more bang for your Facebook ad buck and how to make sense out of your “Direct” traffic in Google Analytics. We also have a discussion about “rented” space for your content—like Medium—and ways to grow your following there while using POSSE to ensure you always own the original copy of everything. And more! Josh’s viral post: The ultimate collection of podcasts for startup founders and the Facebook ad campaign… why is it getting standout results? Known is a personal publishing platform you can use to POSSE your content. Download and install on your own server or use their hosted service, much like you can do with other open source projects like WordPress. Catbait is my (newest) favorite episode of GTD. Probably too good as I found myself dictating thoughts into my Evernote while driving (never a good idea). 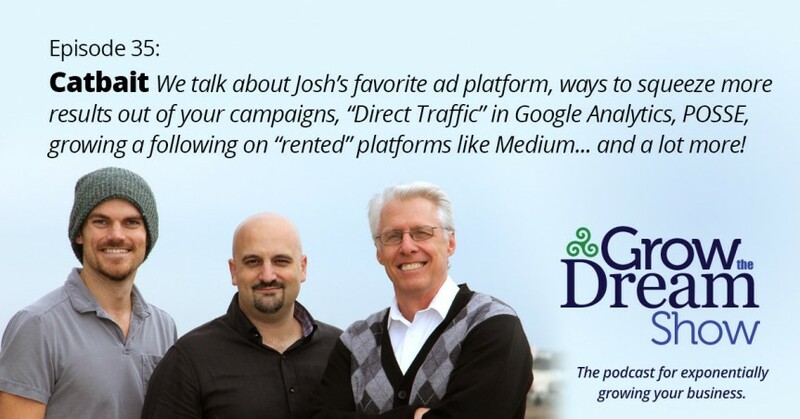 Congrats Josh on your Facebook Ads success, but to hear that your best ad so far has a 6% CTR and $0.10 per click leads me to believe that you haven’t tapped the potential of Facebook. The pixels for retargeting can actually go a lot further than how you are using them now, and with the right creative/targeting you can achieve much higher performance from them. – You guys are totally right that Facebook does not play friendly with GA. When you add a UTM parameter to a Facebook ad, it STOPS showing up as “Traffic from Social” in Google Analytics. But there’s a way around it: Create a unique landing page for each Facebook Ad that you setup (A lot of legwork, but much easier to track). That way, you can look at the landing pages under the Social traffic to get an idea of how many visits you’re getting, and you can look at the “Landing Page” metrics under “Behavior” and “Site Content” to see the conversions from that. Speaking of conversions, you HAVE to try the conversion pixel on top of the regular pixel for FB. – Traffic from the Facebook app DOES show up as “m.facebook.com / referral” on Google Analytics. If you aren’t seeing it on there, it’s probably because you have a UTM attached to the link coming from Facebook (as mentioned above). – David: Glad you’re Facebook video for TongueBrush did well and brought your client sales! I would be skeptical of the way Facebook reports video ad reach though. A “Reach” does not include any views, just the amount of peoples’ News Feeds you showed up in. A “View” (in the objectives for video views) is only 3 seconds long. This makes it look a lot sexier when you see that you’re paying $0.01 per video view… But majority of these “views” are people assessing whether they want to continue to engage with your video or not. I would go with what you mentioned David and use the insights about 10 second views and such as your KPI for that ad. – THANK YOU for the Medium Import tip! I’m about to import my LinkedIn Published posts into Medium today. Question though- Does this qualify as duplicate content at all? Thanks guys, keep up the great work! Thanks, Tim for taking the time to leave such a detailed comment! Hope you made it to your destination safely! When you add a UTM parameter to a Facebook ad, it STOPS showing up as “Traffic from Social” in Google Analytics. Definitely — any time you add UTM parameters, you get campaign-related data out of Analytics instead of other “Acquisition Channel” -type info. But there’s a way around it: Create a unique landing page for each Facebook Ad that you setup (A lot of legwork, but much easier to track). Agreed. This is a way to keep your traffic source info in its proper “Channel” (under Acquisition). However, the effort required (as you point out) is not insignificant. Probably for most of the listeners to our show, it might even be prohibitive. That said, tools like OptimizePress for WordPress sites (that’s an affiliate link, but as always, we only promote tools we actually use & recommend) do make the job of creating (and rapidly duplicating) landing pages quite a bit easier. If you have the resources (technical, time, or otherwise) to do so, creating a dedicated landing page for every campaign is a really smart move. Perhaps we’ll spend some time talking about this on future episodes. Speaking of conversions, you HAVE to try the conversion pixel on top of the regular pixel for FB. I’m a huge fan of conversion pixels. They can be a royal pain to set up (especially the e-commerce pixels), but they give back a huge return in terms of understanding ROI on ad spend. Do you use Google Tag Manager for this, Tim? This is true of traffic that comes to your site via the Facebook app’s “built-in browser.” Because the app has a web browser built in, the traffic comes to your site with “referer” info in the header. However, the built-in browser is a relatively new feature of the app (as browsers go… it’s been in the latest versions of the app for about the last year or so), and many users are still using older versions of the Facebook app that don’t have the browser built in. Also, any user (at least on the Android version of the Facebook app) can modify their settings so that web links on Facebook are opened in their browser of choice, which returns us back to the scenario we described on the episode. As a consequence of all of this, traffic from Facebook can be a pain to track. You have to watch for referer data that lists “l.facebook.com” “lm.facebook.com” “m.facebook.com” and regular old “facebook.com” as the source. Yuck. You might not have heard it, but I actually pointed this out on the show. You’re 100% correct, “reach” numbers do not represent actual views. For this particular campaign, which was more of a branding exercise than anything else, I was absolutely unconcerned about the view count on the video. This was the least expensive “reach” campaign I believe we’ve run in a long time, hence my excitement about the cost. The view count on the video itself was much, much lower. If I were promoting a local business or were more interested in getting the actual content of the video seen, I would’ve been much more interested in the view count than in the “reach” figures. But for this campaign (which I probably should’ve been clearer about on the show), I absolutely couldn’t have cared at all if people watched the video. The ones that did just represented an engagement metric that we found highly attractive (especially at the low cost!). We could actually do a whole episode on analyzing view counts in Facebook. I’m grateful for all the data, but boy can it be a mess! This is especially true for people who don’t use video ads very often. Great question — and all of this just got even more complicated with the latest developments announced by Medium since we created this episode and since you left this comment. We talk about those changes on Episode 36 in more detail. The bottom line answer to your question about duplicate content is “yes.” It does end up creating duplicate content if you post verbatim (or even mostly verbatim. However, as Jay Baer pointed out on Episode 12, Google is a little smarter about who published what where first than we might give them credit for. That said, I ran a little test using the new Medium WordPress plugin (which I just discovered might be misbehaving just a bit), and while it does create a link in both directions (which theoretically helps with Google juice on the target domain, good news if you’re publishing on your own site first), Medium adds a ‘rel=”canonical”‘ tag to its own version, which might serve to lead Google astray. So… the working theory we’re using is to modify the content for Medium and use it to drive traffic back to your own site (or, in your case, your LinkedIn content if that’s what you’re most interested in developing). This can include re-writing or perhaps just using a “teaser” section of the content on Medium with just a short section of something unique that then drives traffic back to your own site. Sorry for the delay in answering your comment, but as you can see, I wanted to do your thoughts justice by taking the time to answer in detail. Hope you find this useful… and thanks very much for listening! Thanks for the responses. That’s interesting to know that a lot of people are still not using the most recent app for FB on their phones. Just checked my analytics and I see what you’re talking about with the “l.facebook” and “lm.facebook,” that’s good to know. There’s some great sites out there like Optimizely (which might be the owners of OptimizePress) that make it easy to create a landing page too. This is kind of the rule of thumb with most ad campaigns: The more planning and and preparation you execute for a campaign, the better it will perform and/or the easier it will be to track. I’m glad you experimented with Medium and it’s new plugin to see what happens. I do see a lot of major publishers posting their whole articles on Medium (word for word), so I’m wondering if they know something we don’t. I sent an Email to Medium’s help team to see if they can give us any more clarification. Thanks for the response! Talk soon. Sure thing, Tim! Thanks again for jumping in to the discussion!